Micromax-backed YU Televentures hinted a few months ago about its upcoming flagship. Today, the company has revealed the first teaser of the device, dubbed as YU Yunicorn. Not just that, the company has also sent out the press invites for the launch event on May 19. The press invite reads,“Fantasy will soon become reality. Join us in the unveiling of the phone that will redefine flagships,” As enchanting as it may sound, but it does not reveal any info about the design of the upcoming device. A few weeks ago, YU had confirmed that its forthcoming flagship will run Android OS with a substantial integration of Android YU. For all those who don’t know, Android YU is a service aggregation platform that was launched along with YU Yutopia, last year. 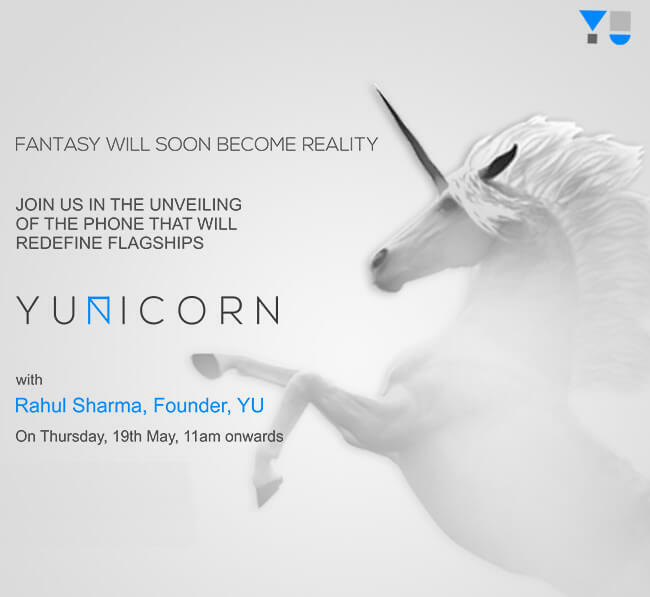 Also, YU Yunicorn is expected to be sold via e-commerce channels only. Well, it it would be interesting to see if the device manages to live up to the hype. Stay tuned with us more info. After marriage with Asin, Rahul Sharma’s big step in mobile market with YUnicorn. Sales stat does not make an icon. We all wait to see what MMX YU delivers to us.